Bringing you the The A – Z of Marketing. Full of advice for small business owners. Being a passionate and dedicated Marketer, over the years I have become near obsessed with measuring; measuring results, measuring profitability and of course measuring the target market. To the average Australian the Census is 20 minutes of their life spent form filling, of which there seems to be no immediate benefit and no future return. For me, the avid Marketer the Census means the collation of data that will allow demographers (people who study the populations characteristics), students and marketers (and I am sure others), the opportunity to extract data, compare shifts, and come up with fantastic statistics – like “43% of Australians had Take Away for dinner on Census night” (Ok so maybe not that one). So already on a Census high, when I came across a question about Market Research on a Motivating Mum Forum by Clever Mama owner Danielle, I decided the topic to explore in my first blog post was staring me in the face! Market Research for Small Business. Creating a survey, sending it out and analysing the results is not new news in the Marketing World, however the digital age has certainly made it a lot easier. I personally recommend Survey Monkey, it’s Free (for a basic package), easy to distribute, it presents very well and most of all it has great in-built analysis tools, while still letting you download all the data to excel to really get into the nitty-gritty of it. Although if you don’t want to get that technical, you can make a survey in word, email it out, then collate the results in an excel spreadsheet. So big or small, here are the 5 Steps to host your own Census! 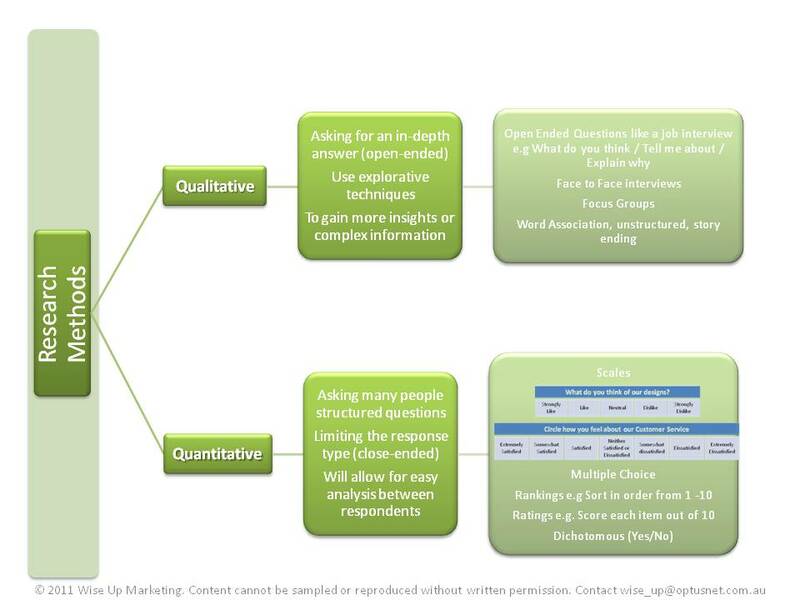 Define your problem We generally undertake Market Research, to solve or shed more light on a problem e.g. Why are our sales decreasing? Or to prove or disprove a theory e.g We are losing sales because our prices are too high. So start by writing this down at the top of your page, as a nice big heading, everything from here has to help us solve that problem. Brainstorm your content Now start to brainstorm, write down words, sentences, thoughts, competitor brands, anything you think is contributing to your problem, anything you would like to know more about that would help. Imagine your ultimate consumer is sitting in front you, this is your chance to pick their brain, as at the end of all this we want to know our ultimate consumer inside out. Organise your questions Although it has been disproved that the attention span of a goldfish is 3 seconds, when it comes to Market Research it’s best to still think that is a fact, so less is best. We want as many full responses as possible, and to get this we need to maximise attention, therefore we need to minimise effort and time to complete the survey. There are two types of questions we can ask, as explained in the picture below. Using quantitative techniques will maximise completion as they are quick and easy to answer, and will also maximise your ability to undertake simple analysis. Create your Survey Organise your questions logically, so you uncover more at each question, use quantitative first, then finish with one or two qualitative so your consumer has a chance to tell you anything you didn’t think to ask . e.g 1. Select the brands you have heard of from the list below. 2. Have you heard of Wise Up? 3. On the scale below select how you feel about the Wise Up brand. 4. Rank the 10 characteristics below in order of importance when you are selecting a Marketing partner 5. Now rate out of 5 how you feel Wise Up performs on each Characteristic. 6. What services do you wish Wise Up also provided (please list below) 7. Is there anything else you think would help us improve? (please write in the box). Don’t forget the demographics It is important to end with some demographic questions (think of the Census!) it could help to know Gender, Age Bracket, Country / State of residence, Metro / Regional etc, these help in 2 ways, firstly we can make sure we only analyse relevant answers e.g If your product is women’s lipstick you might want to discard data supplied by Men, or females under 15 and secondly we can look for differences by demographic e.g 60% of Women 18-25 like our logo but 70% of women 26-34 don’t like our logo, depending on who we are targeting this is more valuable than knowing 55% off all respondents liked our logo. Demographics help us put our findings into perspective, and paint the picture of who our ultimate consumer is. Now all that’s left to do is try your survey out on a few friends first, iron out any wrinkles, then take a deep breath and send en masse. Next week I will do a post on how to analyse your survey responses, but in the meantime, have you done any surveys before? How did you design them? How was the response? Or are you working on one now, feel free to send your draft to me and I’ll help you iron out the wrinkles. This entry was posted on Thursday, August 11th, 2011 at 8:18 pm	and tagged with Customer Profiling, Demographics, Market Research, Market Segmentation, Qualitative Research, Quantitative Research, Survey Monkey, Target Market and posted in Market Research. You can follow any responses to this entry through the RSS 2.0 feed.